Sunday, May 12, 2002... Greetings from Sioux Falls, South Dakota, the eastern end of America's greatest road trip drive. I started the day at The House on the Rock in southwestern Wisconsin, America's greatest one-man roadside attraction. The man's name was Alex Jordan. Fifty years ago he began constructing a house in and on a steep rock outcropping, furnishing it in "Oriental-influenced bachelor pad" style. Visitors who spotted the construction from the road stopped in. Jordan began charging admission, reinvesting the proceeds in the project and letting his imagination run free. By the time of Jordan's death in 1989, the self-guided House on the Rock tour had grown to almost two dozen interconnected buildings, 2-1/2 miles of walking, and innumerable examples of jaw-dropping weirdness. The "house" part of the tour is simply eccentric, though the dozens of glass paperweights embedded in an enormous fireplace bellows offers some hint of what's ahead. Then comes the Infinity Room -- a long, narrow structure hovering above the forest, extending 140' horizontally with no supports below. A picture window set in the floor lets visitors look down on the treetops. Then come the Streets of Yesteryear -- relatively normal re-creations of the shops and businesses of a century ago -- and the first wave of mechanical music machines featuring dozens of instruments crammed into a large cabinet. Later in the tour the music is generated by entire mechanical orchestras arranged around rooms the size of the average home living room, with each instrument played by compressed air operating valves and levers. (Or so it appears -- in fact most of the instruments are on tape and only appear to be played by the compressed air.) The "Blue Room" in the photo is just one of a half-dozen such scenes. For here, the Blue Room is almost conservative. The "Heritage of the Sea" room is built around a three-story-high battle between a giant octopus and a killer whale, with scrimshaw, ship models and the like lining the walkways. Later on comes the World's Largest Carousel: 80' wide, 35' high, with 269 animals and over 150 chandeliers adorning its rim. 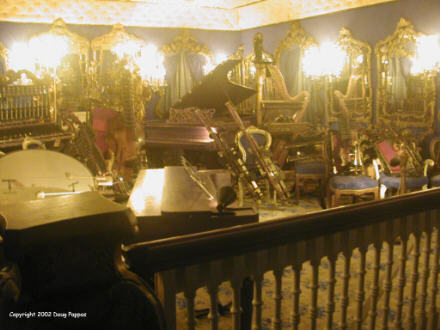 Then come the bizarre juxtapositions -- a room filled with theater organs and a distiller's copper tanks and pipes, another featuring two multistory doll carousels and an enormous cannon -- and some of the collections purchased by Jordan over the decades. I'll go out on a limb to say that The House on the Rock is the only place in Wisconsin to see exact replicas of the British crown jewels, to go with the antique guns, the armor, the huge wooden Circus Parade, the dollhouses and much, much more. The tour took me two hours, but a family with kids can expect to spend about twice as long. From The House on the Rock, my next stop was...The Rock in the House, one of Wisconsin's newest attractions. 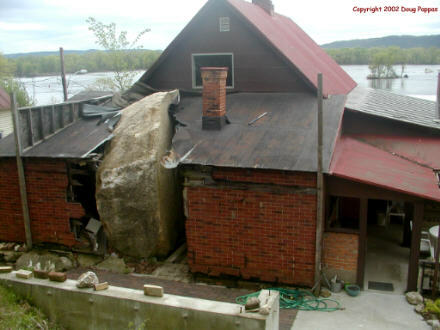 On April 24, 1995, a 55-ton boulder came crashing down the side of a hill in Fountain City, WI, slamming full force into, and through, the back of an occupied house before coming to rest where the stairs used to be. No one was hurt, but when the homeowners realized how much cleanup and repairs would cost, they opted to move out and let the tourists gawk. Alas, the former Old Style brewery no longer displays the World's Largest Six Pack along the Mississippi River in downtown La Crosse. I continued on to Austin, Minnesota, where the Spam Museum opened last fall. The Museum, which doubles as a history of Spam's parent company Hormel, earns high marks for its sense of humor and comes with a well-stocked gift shop. The 60' Jolly Green Giant statue in Blue Earth, MN didn't even have postcards, let alone the Spam-themed socks, boxer shorts, golf tees and other merchandise available in Austin. By the way, Hormel's in-house newsletter is/was known as "The Squeal."